Another frustrating season has gone off the rails and the window of contention that management hoped was still there last season has now passed. The move to start selling off players began in late June with the trading of Steve Pearce and continued up until the trade deadline with deals for J.A. Happ, Roberto Osuna, Seung-Hwan Oh, Aaron Loup and John Axford. We have already started to see some bright spots this year in the play of infielder Lourdes Gurriel Jr. and more recently pitcher Ryan Borucki. This is a top 5 system with many of the top prospects now into the higher levels so good things should be returning to Toronto again soon. The #1 prospect in all of baseball started the season at AA New Hampshire where he was five years younger than the league average. He was no match for the Eastern League as he slashed .402/.449/.671 with 14 HR, 60 RBI in 61 games. 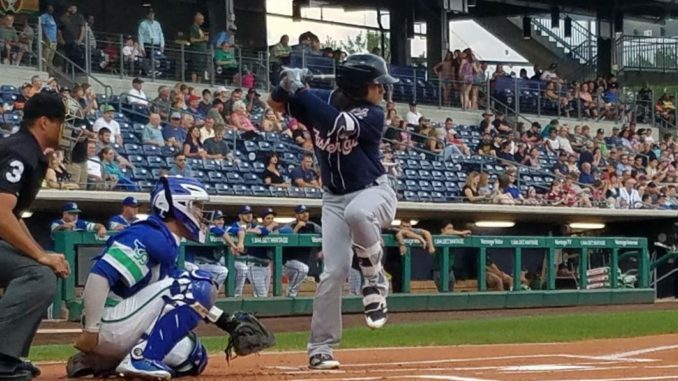 After missing time with a knee injury he was promoted to AAA Buffalo where he is 12 for 26 with 2 HR, 5 RBI and 8 walks in his first 9 games. The Toronto fans are eagerly awaiting his arrival. Bichette is so good some feel he is having a bad season because he is hitting only .282 after lofty numbers of .384 in 2017 and .427 in 2016. Relax everyone he is back on fire slashing .338/.372/.600 since the All-Star break. He leads the Eastern League in Total Bases with 201. One of the top 10 prospects in baseball. Having another outstanding season at AAA Buffalo as he awaits a call to Toronto to begin the transition of taking over catching duties from Russell Martin. He is slashing .273/.387/.472 with 12 HR and 56 RBI. The wait will end with a September call-up. Alford has struggled all season at the plate after suffering a hamstring strain near the end of spring training. He is only slashing .225/.305/.335 with 5 HR and 13 SB at AAA Buffalo. He had a 7 game stint with Toronto early in the season going 2 for 14, He remains the best long-term option to make an impact in the Blue Jays outfield. Unfortunately it has been a lost season for this high upside pitcher. He began the season with an oblique injury and then in his season debut he suffered a broken forearm when he was hit with a comebacker after throwing only 34 pitches. An outstanding season has seen Smith rapidly move up this list. He has a great combination of power and speed. A slash line of .355/.407/.639 in A Lansing and a power surge of 13 HR since his promotion to Hi-A Dunedin in late May have combined to give him totals of .316/.374/.560 with 20 HR, 79 RBI and 26 SB across two levels this season. Selected in the fifth round of the 2016 draft, Biggio has made the biggest leap of any prospect in the system this year. He is second in the Eastern League in HR (24), RBI (85) and OPS (.940) and Total Bases (189) hitting cleanup in a stacked AA New Hampshire lineup. This high-schooler from Texas was the 12th overall pick in the 2018 draft. He has exploded out of the gate with 4 HR, 38 RBI and a slashline of .380/.439/.593 in his first 28 games in the GCL. Having a good bounce back season after an up and down year in 2017. Reid-Foley was 5-0, 2.03 ERA, 1.08 WHIP in 8 starts to begin the year at AA New Hampshire prior to his promotion to AAA Buffalo in late May where he is 7-3 with a 3.49 ERA, 1.15 WHIP. He should be the next starter to debut in Toronto. Pitching in the APPY league at 17 years old, 3-4 years younger than the league average is a great story in itself but dominating is something else. 45 strikeouts and only 12 walks in 33 innings for a 3.32 ERA over 8 starts. It’s only the DSL but Hiraldo is hitting .325/.391/.467 in 50 games. The glut of shortstops in the system is likely the only reason he has not yet been brought stateside. A move off of shortstop is likely in the future for the top-ranked player from the 2017 J2 class. Acquired from the Colorado in the Seung-Hwan Oh deal at the trade deadline. Wall was a first round pick of the Rockies in 2014. He was originally a second baseman but has transitioned to centre field over the past couple seasons. With 28 SB and 10 HR this season he is a good left-handed bat that brings both speed and power. Acquired from Houston in the Roberto Osuna deal at the trade deadline. At the time of the trade he was on a rehab assignment in the GCL where he has made 3 starts while recovering from a shoulder injury. Health permitting he should get a September callup to Toronto. He is a major-league ready pitcher who made 6 starts last season for the Astros going 2-0 with a 6.52 ERA over 29 innings. Drafted in the second round of the 2018 draft in June. The son of former MLB player Jeff Conine is off to a strong start to his pro career slashing .274/.344/.496 with 5 HR while also earning a spot in the Northwest League all-star game. The first round pick from the 2016 draft is enjoying his best season as he continues to move up the ladder. Promoted to AA New Hampshire in May he is 7-4 with a 3.32 ERA in 16 starts earning a spot on the Eastern League all-star team. Acquired from Colorado in the Seung-Hwan Oh deal at the trade deadline. Spanberger has a lot of power with 23 HR and 80 RBI. He was leading the SALLY in OPS (.942) at the time of the trade. After 9 games at A Lansing he has already been promoted to Hi-A Dunedin. Noda is slugging his way to another excellent season slashing .261/.419/.475 with 15 HR and 67 RBI. Drafted in the third round of the 2018 draft. Kloffenstein is a 6’5”, 220 lb. right hander with a 96 mph fastball and a lot of promise. Acquired from the Yankees in the J.A. Happ deal at the trade deadline. McKinney was the first round pick of the Oakland A’s back in 2011. Combined at AAA Scranton/Buffalo this season he has a slashline of .228/.296/.476 with 13 HR. He is major-league ready and will be in the mix for a starting outfield spot in 2019. Urena had an 11 game stint with Toronto this season where he hit .278/.278/.444 with 1 HR but he has only hit .213/.242/.324 with 4 HR at AAA Buffalo. Major-league ready he should be back up in September and added into the crowded infield mix. After struggling through a very tough year in 2017 he has rebounded with a solid season slashing .272/.344/.437 with 11 HR and 42 RBI in his second full season at AAA Buffalo. Acquired from Boston for Steve Pearce in late June has a slashline of .278/.328/.426 since being promoted to AA New Hampshire. He was enjoying a breakout season at Hi-A Salem prior to the trade slashing .313/.363/.477 with 7 HR. Healthy for the entire season his slashline is .223/.261/.337 with 4 HR while catching the majority of the games for AA New Hampshire. Leading the organization throwing out 47% of base stealers while slashing .235/.337/.358 with 4 HR, 38 RBI. Speedy infielder has a slashline of .228/.322/.374 , 6 HR, 42 RBI, 39 SB in his first full season league. Ramirez is nearing the end of a third full season at the AA level and finally showing the promise that he had in the lower minors earlier in his pro career. A strong second half has pushed his slashline up to .309/.363/.454. With little more to prove in the minors a September call-up is a possibility. Has yet to play in 2018 and will miss the entire season with a shoulder injury. The 2016 39th round selection out of the Bahamas continues to exceed all expectations slashing .282/.350/.435 with 6 HR, 46 RBI and 27 SB. He was named to the Midwest League all-star team. Harris has rebounded from a disappointing 2017 season. The first round pick from 2015 has cut down on the walks in his second season with AA New Hampshire leading to a 9-4 record and 4.73 ERA. He also had two good starts with AAA Buffalo in late-June. Hitting .279/.421/.361 in his second season with Bluefield. Former first rounder from 2011 recently returned to the Buffalo bullpen after spending a month on the DL. Prior to that he made 7 starts with mixed results going 1-0 with a 4.11 ERA. Starting to look like a pretty good investment, he was signed for $10,000 in the same J2 class that the Blue Jays gave some guy named Vlad $3.9M. His 7 home runs are the most hit by a Vancouver player since 2015. He has a slashline of .254/.3o9/.514. He leads the AA team with a 10-5 record, 3.43 ERA and 105 strikeouts in 115.1 innings. A rollercoaster season has seen him post 8 straight victories in April/May before making one spot start with AAA Buffalo. When he returned to AA New Hampshire he had a very rough month of June going 0-4 with a 7.52 ERA but has since turned things back around. Diaz has been impressive this season, he was promoted to Hi-A Dunedin in late May after dominating the Midwest League going 5-1 with a 2.08 ERA. In Dunedin he has a 3.95 ERA and 1.19 WHIP. Unheralded signing from the 2016 J2 class, Moreno was having an outstanding season leading the Gulf Coast league in hitting .413/.455/.652 when he was recently moved up to Bluefield. Top J2 signing from 2016 IFA class is just getting started slashing .259/.341/.362 in the Gulf Coast League. He is a strong defensive shortstop. Injuries have slowed his progress over the years but healthy this season he has pitched well with 3.63 ERA and 1.24 WHIP in 18 games (12 starts). Getting old for the level, a move up to AA is overdue. Selected in the fourth round of the 2018 draft out of TCU. Wymer is 3-2 with a 4.64 ERA in 8 appearances (4 starts) to begin his pro career. After enjoying a breakout season with AA New Hampshire where he was leading the Eastern League in runs scored (68) and second in hits (92) he was promoted to AAA Buffalo in mid-July. At 26, he could be in line for a September call-up and should be in the mix for the 4th outfielder job in Toronto for 2019. .266/.307/.358 with 37 RBI in his second season at Class A Lansing. Having a great season out of the AA bullpen, 2-2, 3 SV, 2.79 ERA, 11.2 K/9. With the Toronto bullpen in flux a late-season call up to see what they have here is not out of the question. .275/.341/.376 with 5 HR and 56 RBI mostly hitting leadoff in Hi-A Dunedin all season. Florida high schooler drafted in the sixth round in 2018 draft is hitting .197/.303/.303 in first season of pro ball. After going 9-3 with a 4.26 ERA with class A Lansing he was promoted to Hi-A Dunedin in July where he is 3-2, 4.76 ERA in 6 starts. Struggled in his second season with AA New Hampshire going 0-4 with a 9.91 ERA and 2.21 WHIP in 8 starts before going on DL in May. After injuries hampered the start of his career, former third round pick from the 2013 draft is finally having a breakout year going 8-4 with a 2.58 ERA in 21 starts. He made one spot start with AA New Hampshire in May giving up 4 hits in 6 IP. Struggling this season with .224 AVG but on pace for a career high in HR with 11, needing only one more to match his career-high 2016 total. thanks Rob. Yes Bergen is having an outstanding season in the NH bullpen, giving up only 1 ER since May 1. I tend to downgrade relievers as they are mostly just filler in dynasty leagues until you actually see them working high-leverage innings in the majors. He’ll be on the 2019 pre-season list, especially if he earns a September call-up next month. Closer of the future? Who knows at this point?